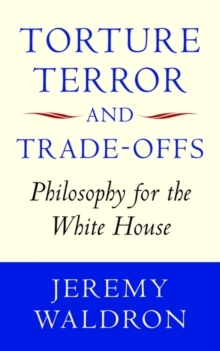 Jeremy Waldron has been a challenging and influential voice in the moral, political and legal debates surrounding the response to terrorism since 9/11. His contributions have spanned the major controversies of the War on Terror - including the morality and legality of torture, whether security can be 'balanced' with liberty, and the relationship between public safety and individual rights. He has also tackled underlying questions essential to understanding thepractical debates - including what terrorism is, and what a right to security would entail. This volume collects all Waldron's work on these issues, including six published essays and two previously unpublished essays. It also includes a new introduction in which Waldron presents an overview of his contribution, and looks at the problems currently facing the Obama administration and the UK Government in dealing with the legacy of the Bush White House. The volume will be essential reading for all those engaged with contemporary politics, security law, and the continuing struggle for an ethical response to terrorism.